The color and grace of Central Asian women’s dance will enliven the Seattle Asian Art Museum when DC-based Silk Road Dance Company presents a series of public programs and concerts on Saturday May 5th. The award-winning ensemble will share rare dance traditions in stunning costumes in conjunction with the current “Colors of the Oasis” exhibition of Uzbek textiles. 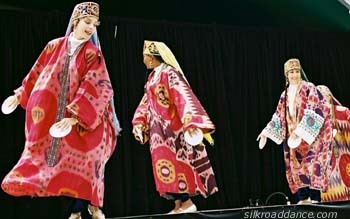 Seattle, Washington — The award-winning Silk Road Dance Company will share the beauty of Uzbek dance at the Seattle Asian Art Museum on May 5, 2012. Based in Washington, D.C., the dance ensemble will present family friendly daytime shows as well as two evening concerts in conjunction with the Colors of the Oasis exhibit of Central Asian textiles. SAAM’s current Colors of the Oasis exhibition features dazzling textiles that were created in the oasis cities of Central Asia, primarily Uzbekistan. Silk Road Dance Company’s extensive repertoire of Uzbek dances and colorful traditional costumes will provide another dimension to exhibit. Family friendly daytime programs at 11 am, noon, and 1 pm, are free to the public. Tickets are required for the 6 pm and 8 pm evening concerts and can be reserved online. Silk Road Dance Company (SRDC) has deep ties to the Seattle area through Artistic Director Laurel Victoria Gray, who founded the ensemble in 1995. A native of Washington state and former Seattle resident, Gray was active in the Seattle-Tashkent Sister City Association and lived in Tashkent for two years to study traditional dance and culture. Seattle residents can also study dance with Gray while she is in Seattle. She will help prepare a Silk Road themed marching team that will participate in the 2012 Fremont Solstice Parade. Rehearsals will take place at VDP studio, a business owned by Delilah Flynn, a Fremont resident and professional dancer who has for 20 years has organized dance teams for the parade. Copyright 2012 and 2013, Silk Road Dance Company®. All rights reserved.